14th iteration of show to feature about 200 boats for sale. 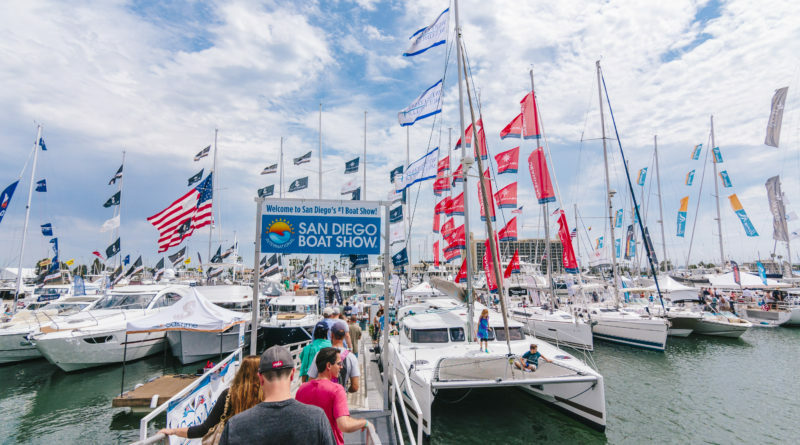 SAN DIEGO ― San Diego’s boat lovers will spend another Father’s Day weekend walking the docks as one of the region’s largest boat shows returns to Spanish Landing, June 15-18. The 14th annual San Diego International Boat Show, produced by Duncan McIntosh Co., adds more than 100 feet of new dock space and 150,000 square feet of exhibitor space compared to last year’s event. 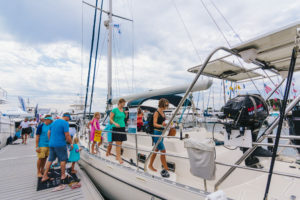 This year’s boat show – just like last year – takes place just before the official start of summer. Boaters will be able to view about 200 boats on display at Spanish Landing Park East on Harbor Island, including an expanded selection of 10 superyachts (80-footers and larger). The latest in nautical gear, gadgets and accessories will also be featured at this year’s San Diego International Boat Show. A few yachts will be making debuts at this year’s San Diego International Boat Show. Denison Yachts will be displaying Ipanema 58, which is making its West Coast debut. Meanwhile Free Form Factory offers attendees demos of its first fully electric power watercraft, Gratis. South Coast Yachts will debut the new Monte Carlo 5, a 50-foot luxury fly bridge yacht, and the new Gran Turismo 46. Six new Beneteau sailboats from 31 to 55 feet will also be on display at this show. Due to high demand, Beneteau is sold out for the model year 2017, so these show boats are the only boats available for delivery for a full Southern California boating season. This beautiful one-owner M60 will be on display for guests to tour this spacious and thoughtfully laid out vessel which features an internal staircase leading up to the air-conditioned, fully enclosed fly bridge which offers a retreat from the noise and wind allowing for easy conversation even while underway. The spacious master suite has an abundance of storage in drawers, hanging lockers, a flat screen TV and a private ensuite. A forward guest suite includes bunks to starboard and a day head easily accessed by both areas. The walk-around side decks of the 60-foot Maritimo allow safe and easy access to the foredeck. Stop by the Compass Point Yachts’ display to experience the Maritimo Yacht, renowned for performance, practicality and engineering excellence. Experience the 54-foot 1987 Bertram convertible and its expansive cockpit at the boat show presented by Crow’s Nest Yachts. This classic sportfisher has rebuilt engines with only 700 hours, ZF electronics, Onan generators (5 years ago), large water maker, SAT radio, fighting chair, granite counter tops, newer stove/oven as well as a stainless standup fridge and freezer. Imagine sailing away on the Bali 4.0. This catamaran is characterized by a single cockpit/saloon area, entirely flush and unencumbered by bulkheads, accessible via an immense folding glass door on electric rams. Cruising Yachts will be showcasing not just the Bali 4.0 but also the NC 11 and Jeanneau 54 at the boat show. Speaking of catamarans, Denison Yacht Sales will be featuring two of Fountaine Pajot’s most popular and sought after catamarans at this year’s boat show. The Ipanema 58, Fountaine Pajot’s flagship will be showing off her sleek and majestic figure just in time for summer. The main salon has a full-size galley and an enormous dining area with sliding glass doors which open wide to the cockpit. Don’t miss this opportunity to see her in person. Also featured at the show will be Fountaine Pajot’s very popular Lucia 40. She has many of the same amenities as her larger sister including a large cockpit, very spacious main salon and lots of natural light due to the panoramic layout of the windows. Come by Big Bay Yachts display and check out the incredible brokerage 48’ Tiara Convertible 2010, LLC owned and loaded with Furuno electronics and west coast fish rigged. This boat is loaded with options like a staircase to the FB, sea foam green hull color and much, much more. Big Bay Yachts is a proud sponsor of this year’s Bloody Decks annual Yellowtail Shootout June 23-25th. Come See the all new Hampton 650 Pilothouse. Hampton Yacht Group will have this solidly built cruiser features a custom interior with three spacious staterooms below deck. Stop by the Stan Miller Yachts display to see a variety of sportfishing and cruising yachts, including a 1993 Offshore Sedan 48 and a new Back Cove 37. Suncoast Yachts will be featuring an Island Packet 485 custom built for the original owner and completely outfitted for cruising (the buyer’s plans changed and he never took delivery). Come see this high quality, well-equipped yacht. Boat show attendees can also attend Powerboat 101 lessons, which is new this year. Powerboat 101 and Sailboat 101 offer a variety of lessons for attendees. Seminars and workshops will also be on the docket. The “Try It Cove” will feature inflatables, fishing kayaks and paddleboards. Adults will be able to enjoy a wine and beer garden, June 16-18, at the new Anchors and Ales Beer Garden. The garden will feature craft beer and wine tasting. Tickets for the Beer Garden is $25 and includes four tastings and food samples. Food trucks, live entertainment and a tiki bar will also populate this year’s boat show. San Diego International Boat Show’s hours are noon to 7 p.m. on June 15 and 16; 10 a.m. to 7 p.m. on June 17; and, 10 a.m. to 5 p.m. on June 18 (Father’s Day). Tickets are $15 for adults and $10 for those with military identification. Children 12 and younger are free with a paid adult. Visit sandiegointernationalboatshow.com for more information. The 2017 San Diego International Boat Show, the region’s premier summer boating event, provides guests an all-access pass to discover the boating lifestyle and a chance to shop the newest boats and marine accessories. More than 200 vessels – included an expanded selection of superyachts – will be on display. * Thursday, June 15: Noon-7 p.m.
* Friday, June 16: Noon-7 p.m.
* Saturday, June 17: 10 a.m.-7 p.m.
* Sunday, June 18: 10 a.m.-5 p.m.
Motoryachts, superyachts, trailer boats, sailboats, entry-level family cruisers, sportboats and luxury superyachts. Seminars, workshops, demonstrations and the latest in marine accessories. $15 for adults; free for children 12 and younger. Active military personnel, $10. Major credit cards accepted.